A new hunger strike started on Monday, 14 May 2018, by 4 members of the Kurdish refugee family, who have been protesting outside the Presidential Palace and the Ministry of Interior for a total period of 15 months. It is reminded that the Hassan-Janbali are Ajanib (stateless Kurds from Syria), living in Cyprus for more than 11 years. From October 2014 to August 2015, the family, along with other stateless Kurdish refugees, protested outside the Ministry of Interior. They discontinued their protest after one member of the family who fulfilled the required terms was granted Cypriot citizenship and a proposal by the then Minister of Interior, Mr Socrates Hasikos, that the other family members submitted their citizenship applications in a year from then, when their stay in Cyprus would meet the time requirements. These applications were submitted in the period 2015-2017 but they were all collectively rejected by the Ministry of Interior on 27/3/2017, on unsubstantiated claims. This was confirmed by Mr Hasikos himself who, according to a letter of the United Nations High Commissioner for Refugees (UNHCR) to the refugee family, dated 19/04/17, in a meeting with the UNHCR Director, had admitted that the said rejection was wrong and that he had given directions for the review of the applications for citizenship. After Mr Hasikos’ resignation and the appointment of the new Minister of Interior, Mr Constantinos Petrides, the family mounted a new protest outside the Presidential Palace and subsequently outside the Ministry of Interior. On 6/6/2017, the protest escalated, with a hunger strike by two family members, which was suspended after 67 days. 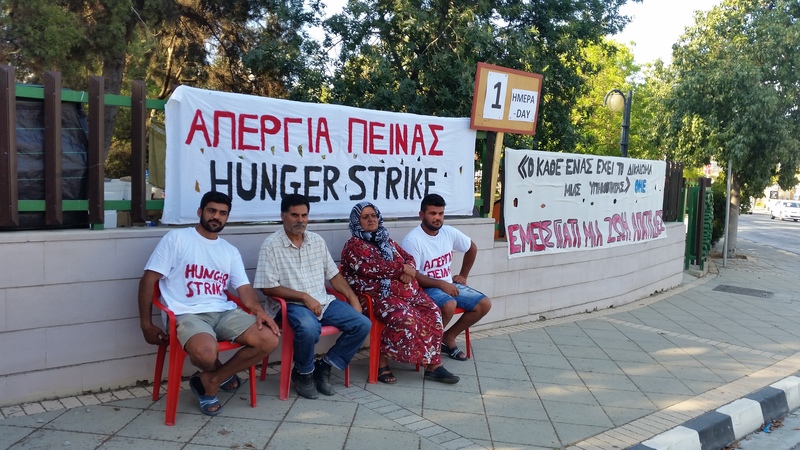 The hunger strike was suspended as a sign of good will on the part of the strikers and their trust in the Cypriot authorities for keeping the promises of the Director General of the Ministry of Interior for the immediate review of their applications. Almost ten months on, and despite the efforts, positive position and appeals of other independent authorities, organisations and agencies, such as the Chair of the Parliamentary Committee on Internal Affairs, the Commissioner for Children’s Rights, UNHCR, KISA and other NGOs, but also political parties, the Minister of Interior insists on his unacceptable position for not granting citizenship to the refugee family. The pledge of the former Minister and the Director General of the Ministry of Interior for reviewing the applications for citizenship appears to be opposed by the current Minister of Interior, who has conveyed messages to the family in various ways that he will not have their claims reviewed unless they terminate their protest . The family, on the other hand, do not trust the authorities as the promises of the authorities have never been honoured every time the refugees suspended their protests. KISA considers that the protest of the stateless Kurds is both justified and legally protected as the right to assembly and protest is a constitutionally protected human right. We also consider it unacceptable for the state to blackmail citizens exercising their constitutional rights with punitive measures, particularly when this punishment includes consequences on the health and bodily integrity of the protesting citizens. KISA points out that the new hunger strike of the Hassan-Janbali family is a last cry of agony and despair to the Minister of Interior and calls on him to honour the pledges of his Ministry for granting citizenship to the remaining members of the refugee family. KISA also calls anew on the President of the Republic to heed the appeal of the protesting refugees and, in meeting the international and European obligations of Cyprus, to recognise their fair claims to the right to life and human dignity.